I always enjoy putting these together and with plenty of new things to share from Christmas and New Year, it was perfect timing. With January momentum fading, a small pick-me-up purchase isn't the worst idea. Whether it's a magazine, candle or something else, it's nice to buy yourself something in reward for working damn hard. This is a magazine I picked up on a trip to Leeds at Village. The guys in store recommended it after I said I was looking for something that involved a mix of interesting interviews with creative’s, coffee and fashion. Normally if a magazine has say around four interesting pieces inside it, I’ll buy it. 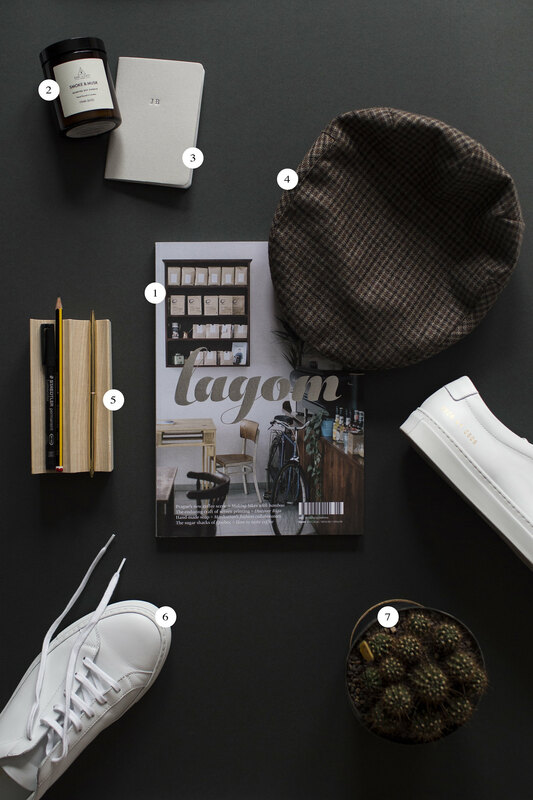 But Lagom is a page-turner from cover to end. I can’t recommend it enough. A present from my sister at Christmas, this candle has been put to good use! I lean towards more musky candles and this Earl of East candle is a treat when I’m burning it. Even when I’m not, I’ll unscrew the lid and have a quick inhale when it’s on the desk - that's not weird, is it? Not-Another-Bill sell the most brilliant subscription gifts and this little embossed notebook is one of them. It’s pocket-sized so it’s perfect for when I want to go old school with my to-do lists and write something down quickly. For those that follow me on social and have read previous fashion blog posts, you’ll know I’m a big hat fan. I’ve picked up a couple new ones from Brixton and this flat-cap style is definitely something new for me. I’ve had a couple digs from family members, but I think it’s such a cool hat to try out. A trip to Copenhagen isn’t done properly without a couple purchases. I bought this pencil tray from HAY House (it’s called a UU) and it sits proudly on my desk without fail. These trainers weren’t necessarily something I was actively looking to buy, but when END. had a 25% sale on almost everything, these trainers went straight into my basket. I’m praying I keep these clean.